The diagram shows a priority sign for buses. Which of the following statements is correct? The diagram shows a priority sign for buses. Which of the following statements is correct? A. Priority applies when the bus is travelling in a built-up area. B. Priority applies at all times. C. Priority does not apply when the speed limit is 40 Km/h. Much of your driving will likely be done on fairly wide roads with good markings and visibility, but there's only so much that traffic engineers can mitigate dangers, so here are some that you'll need to think about as you learn to drive. There are no run-off areas on a bridge, so if something goes wrong you've got limited options for where you can steer. Additionally, many bridges are narrower than roads and if there's a large vehicle coming towards you, there might not be enough room for you to both pass safely. You might see signs indicating whether you have right of way or the other vehicle has right of way. 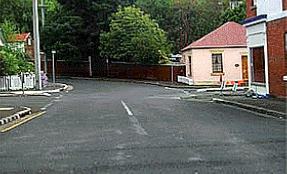 If not, slow down, keep left and give way to vehicles that are already on the bridge. In the image below the intersection on the right has a restricted view - you can't see traffic coming from the side road until it's right there. And, traffic turning form that road probably doesn't have a good view of the corner up ahead of you, either. By reading the road you can tell what type of challenges other drivers will have and you can be aware that it might cause them to make a rash manoeuvre. Strong winds make it difficult for motorcyclists and cycle riders as it can blow them off course. Also, if there's a really strong tailwind and you are driving a heavy, tall vehicle, it will lengthen your braking distance. When traffic is busy it could be that lanes are too narrow for you to safely pass cyclists. In these cases you must remain behind the cyclist until the road is wide enough for you to overtake. If other drivers are impatient behind you then don't cave in to the pressure; stay calm and overtake the cyclist when it's safe. Motorcyclists and cyclists are more difficult to see, in general, but when traffic is busy and your attention is diverted in many other directions you should always ensure that you look twice. Emergency vehicles use lights and sirens. Ambulances, fire engines and police cars have red and blue lights. If you hear the siren of an ambulance or fire engine approaching from behind, move into the left lane, or stay left, so that they can pass easily. Don't make any erratic manoeuvres such as braking heavily. If you are at an intersection, it's the emergency vehicle driver's responsibility to negotiate around you. Don't drive into an intersection or through a red light to get out of the way of an emergency vehicle. If you have a green light and you hear a siren behind you, wait to see what the emergency vehicle is doing and only proceed if they are right behind you and cannot pass. 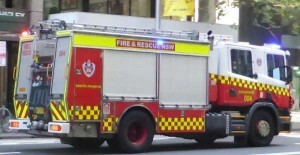 Emergency vehicle drivers will often use the other side of the road to get through an intersection. If you hear the siren of a police car behind you, pull over to the left. If it goes past, you can continue. If it stops behind you, it is pulling you up for some reason. Not giving way to emergency vehicles is an offence punishable by an on-the-spot fine. As you will be constantly scanning ahead when you are driving you should be able to anticipate when the road surface will change. For example you might see gravel on the road, or that there are potholes. If you are coming up to an area where the surface changes, do your braking before you get there - you want to try to avoid having to brake once the surface has become more slippery. For bumpy road surfaces, it's a good idea to check any loads you are carry haven't shifted. When driving around roadworks there will possibly be workers on the road, uneven surfaces and other dangers. Observe and obey the signs to keep everyone safe. Slow down and increase your following distance. When vehicles are parked on either side of the road keep an eye out of children that might run out in front of you and, if you are motorcyclist, drivers that might open a vehicle door or pull out in front of you because they haven't seen you. Adjust your riding position more towards the centre line to give yourself more of a buffer. Whenever there are kids playing near the street, or walking pets (a dog can suddenly run across the road), be prepared to slow down and stop if you need to. You are driving in a 60 km/h zone, with only one lane for traffic in your direction and you see a bus ahead (with the priority sign below displayed on the right rear) signalling its intention to pull out from a bus stop. You must give way to the bus. 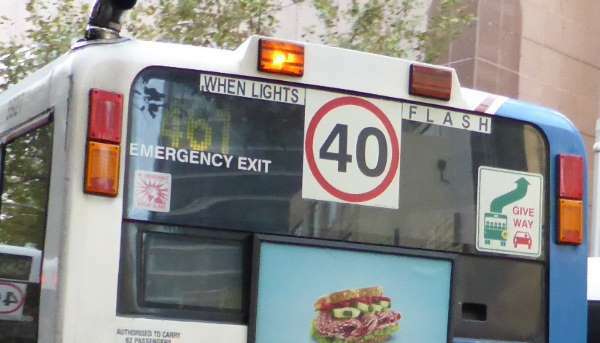 The speed limit of 40kph is also in force when you pass the bus and the lights are flashing. The front lights will be flashing, too. If a friend lends you his car and it is very noisy and blows a lot of smoke, and he tells you the vehicle has been given a defect notice but it's still OK to drive it, you must check the defect notice before you drive it to make sure it's legal to drive the car. A defect notice will be issued for a failed inspection and a vehicle will not pass a subsequent inspection until the necessary repairs specified on the defect notice have been fixed. In the case of a minor defect notice there will be a time period specified in which the defects must be fixed. For a major defect, the vehicle might be grounded (prevented from driving on the road). If your car registration expires today and you have your car inspected for registration renewal but it fails the inspection, after today you must not drive the car until it has been repaired, passed another inspection and registered. It is an offence to drive an unregistered car and you might invalidate your insurance policy. If an oncoming vehicle crosses the centre line and is coming straight at you and you cannot stop you should brake, look for room to the left, sound your horn and flash your lights. The more speed you can scrub off, and the further you are to your left, the more chance you have of avoiding an accident, or at least minimising its effects. All parts of your vehicle must be kept roadworthy at all times. If your tyres wear out, it's your responsibility to replace them rather than wait to be pulled over and told by the police; if you buy a car and the spare wheel has no tread, you will need to replace it; if your shocks are worn, then it is your responsibility to have them replaced. It's an offence to obstruct clear vision of your number plates. You are not allowed to use a hand-held phone when driving. P2 and full licence holders can use a hands-free phone kit, or if your vehicle has Bluetooth phone integration then you can use the phone to answer and make calls; P1 drivers and provisional riders are banned from using phones in any way, and that includes in hands-free mode or with the loudspeaker operating, or sending or reading text messages. A phone call is still a distraction, though, and it's safer to stop to take the call. Turn the radio down or off if you are approaching challenging driving conditions. Don't try to adjust the radio while you are moving - do it at traffic lights, or stop on the side of the road. Make sure that there are no loose objects rolling around in the foot wells - put them in a box in the boot. If you are using a GPS unit, program it before you set off, not while you are moving as it takes your eyes away from the road. Pets should be suitably restrained. Children should have something to occupy their attention so that they're not distracting you. If you are carrying passengers (e.g. rowdy friends), be aware that they can distract you from the road quite easily. You can always tell them to be quieter.